SeaWorld has perfected an excellent recipe for adventure – take spectacular entertainment, combine it with animal interactions, and add thrilling rides to have a "fin-tastic" time. As the world's premier marine adventure park, SeaWorld Orlando features 200 acres of world-class shows, thrilling rides and unforgettable animal encounters. SeaWorld guests can get splashed by Shamu, dine eye-to-eye with sharks, sleep next to manatees, or be suspended mid-air on a state-of-the-art roller coaster – all in one adventure-packed day. 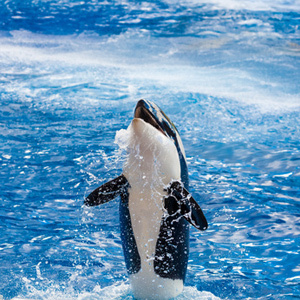 We are sure you will enjoy your visit to SeaWorld in Orlando Florida. Trainer for a Day - Six guests per day shadow killer whale, dolphin and sea lion trainers to learn training techniques. False Killer Whale Interaction Program - Come face-to-face and interact with massive, 12-foot long false killer wales and conduct animal training sessions alongside SeaWorld trainers. Animal Care Experience - Guests bottle feed orphaned manatees and learn what it takes to care for seals, walrus, and beluga whales. Sharks Deep Dive - Participants don SeaWorld wetsuits and either snorkel or sucba dive in an authentic shark cage during their close encounter. To the Rescue! - This one-hour tour showcases the park's manatee and sea turtle rescue and rehabilitation programs. Polar Expedition - Explore the world of polar bears and beluga whales and touch a live penguin in this one-hour tour. Predators - Touch a live shark and uncover the mysteries of these predators in this one-hour program. Other educational program include more than 200 year-round camp classes that range from half-day adventures to sleepovers to week-long adventures. Take adventure to the extreme by hopping aboard SeaWorld's hair-raising thrill rides. The newest, Kraken, is a monster of a coaster that is the fastest, tallest, longest and only "floorless" roller coaster in Orlando. Kraken thrusts riders 15 stories in the air, traveling at speeds of 65 mph and turning guests upside down seven times. If you're not as brave, Journey to Atlantis is a water-coaster ride that includes two of the steepest, wettest and fastest drops to be found at any theme park in the world. It is the first attractions in the world to combine the awesome adventure of a high-speed water ride and a careening roller coaster. Guests can also visit the frozen north with a chilling ride aboard Wild Artic "jet helicopters" in an unforgettable motion-based flight. After narrowly escaping a fierce snowstorm and sudden avalanche, guests come face-to-face with real walruses, beluga whales and polar bears. 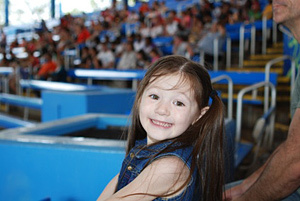 Of course, no visit to SeaWorld creates more memories than its array of spectacular shows. At the world-famous Shamu Adventure, visitors witness the awesome power of Shamu the killer whale and the amazing feats performed by trainers and these amazing animals. Opt to sit in the stadium's "Soak Zone," and get drenched by Shamu enthusiastically sending heaps of water toward the audience using his massive tail and fins. Land lovers will enjoy the Pets Ahoy! show featuring a multi-talented menangerie of dogs, cats, birds, rats, pot-bellied pigs and skunks performing silly skits and surprising stunsts with a comical twist. Most impressive is the fact that nearly all of the fabulous furry and feathered performers of Pets Ahoy were rescued from local animals shelters before they found fame at SeaWorld. The always hilarious Clyde and Seamore Take Pirate Island show is a swashbuckling adventure as sea lion stars Clyde and Seamore, Sir Winston Walrus and O.P. Otter search for a lost treasure with help from the trainers.